I’m recently back from my first trip to the Galápagos Islands. I was lucky enough to visit these islands located 600 miles off of the coast of Ecuador while working as a Photo Expert and Instructor for National Geographic Expeditions and Lindblad. Calling these pristine volcanic islands my “office” for two weeks while navigating above and below the Equator on the National Geographic Endeavour was an unparalleled experience. 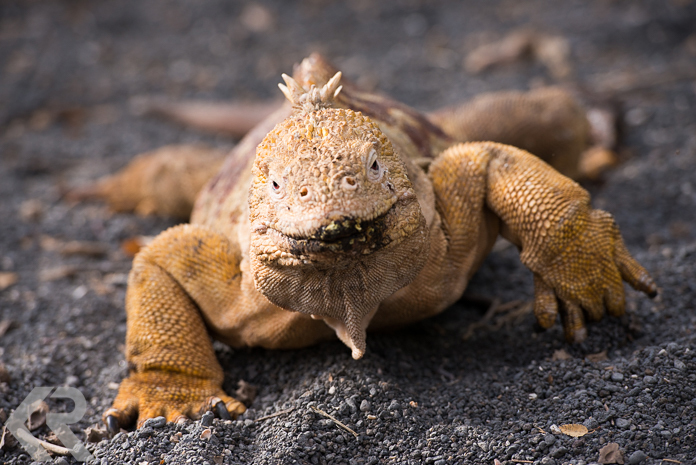 With my background as a photo editor, you can imagine that I’ve seen quite a few images from the Galápagos Islands. I knew I’d be seeing giant tortoises (for which the islands are named) and the popular blue-footed booby. What I wasn’t prepared for was what it felt like to be on the islands. My first impression was that I’d arrived in a prehistoric land, sans dinosaurs but, as Darwin learned over a few short months in 1835, teeming with a variety of species who have adapted quite uniquely to their environments. You could not only feel the age of the islands, but you could see it as we traveled from west to east, from the youngest to the oldest islands. At the young age of less than a million years old, Fernandina is still volcanically active and growing while nurturing scores of animals.Visiting older Genovesa you see only the crescent moon of a sinking caldera, an island in the final stages of life yet still home to thousands of seabirds. During the two weeks on board I met guests from as near as Oregon and as far as Australia, children whose ages were in the single digits and retired folks who made being in their eighties look easy, and eager-to-shoot photo enthusiasts and people who didn’t know they’d have so much fun with their cameras while on the islands. I worked with a talented photo team, namely Jennifer Davidson and Jose Calvo, and for one week had the chance to work a legend of National Geographic, Annie Griffiths. During every outing I was impressed with the knowledge of Lindblad Expeditions’ naturalists, whose passion for the islands is palpable. And every time I was on the ship I was taken care of by a friendly and professional crew. And the best part is that I get to go back. I’ll be returning to the islands for two more photo-specific expeditions on October 24th and 31st (details here). I hope these photos give you an idea of what it feels like to be on an expedition in the Galápagos. And I’d love to see you there in the fall! 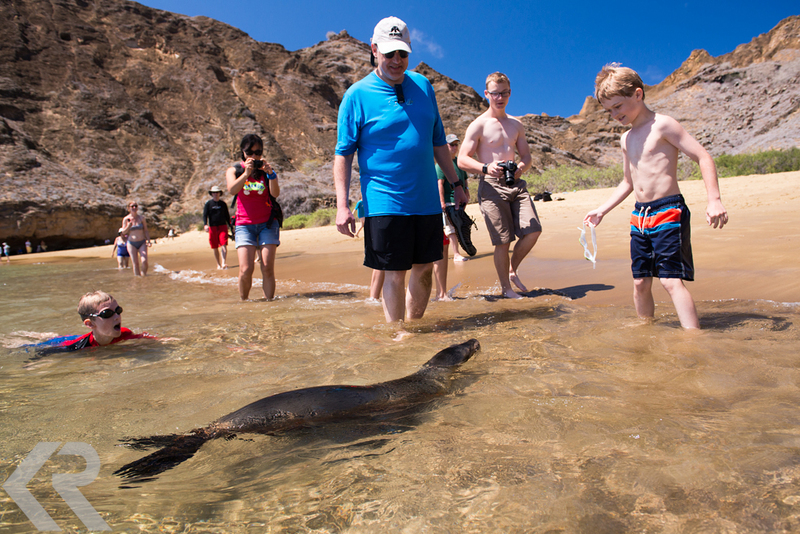 One of the most delightful things about the Galápagos is how close humans can get to the animals. 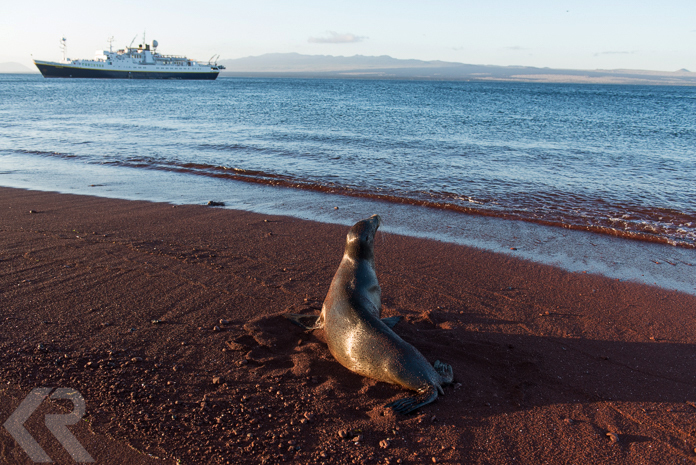 Sea lions, like this one at Punta Pitt, are as curious about us as we are about them. Because the animals on the islands have few predators, they are unafraid. Using their energy to get out of our way would be wasteful, but visitors must keep a 6-ft distance to comply with national park rules. The hull of the National Geographic Endeavour glistens in the last light as we return from a hike on Genovesa Island. The ship was our base as we explored the islands using small inflatable boats known as zodiacs to ferry us to shore or out on deep-water snorkels. 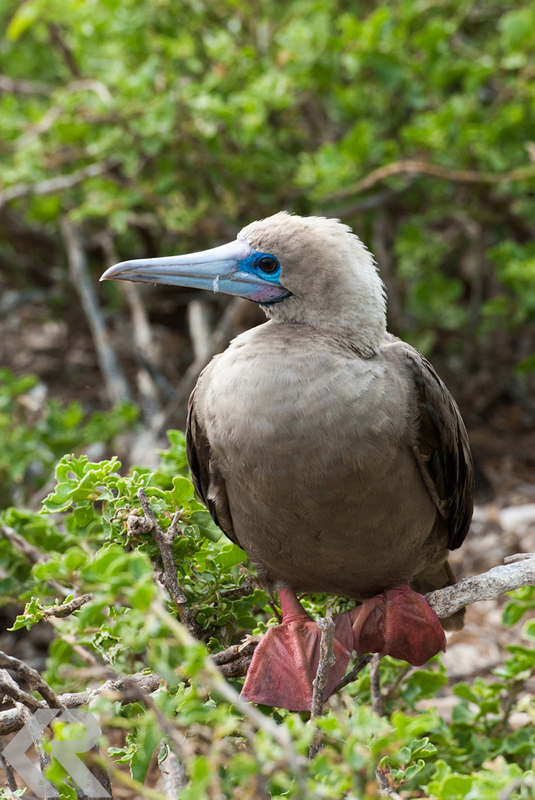 Everyone hears about the blue-footed booby, but my personal favorite booby is the red-footed species. Their bright blue and purple beaks won me over. Speaking of boobies, we were lucky enough to be present for the first spotting of a Peruvian booby on the Galápagos Islands. Here naturalist Walter Perez and his zodiac full of guests photograph the surprising animal. 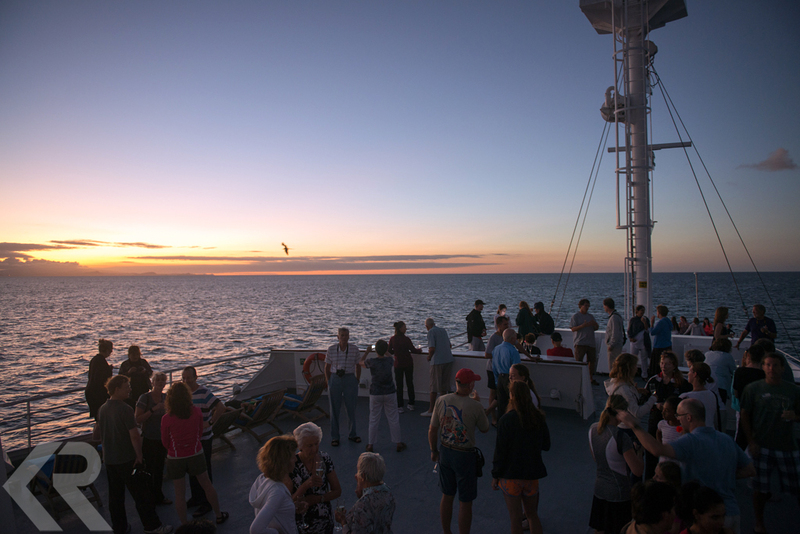 Read more about the news on the Lindblad Expeditions blog here. Snorkeling is an almost daily activity while on expedition in the islands. 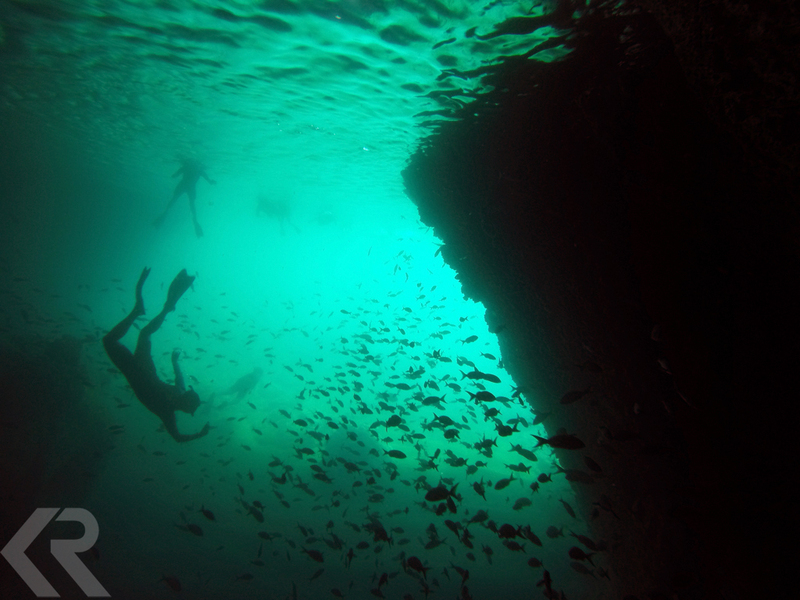 With visions of ancient pirates in our minds, we swam into a cave at Buccaneer Cove on Santiago Island and found a large school of fish. During the snorkels we not only swam with fish, but also with sea turtles, sea lions, sharks, penguins, and cormorants. 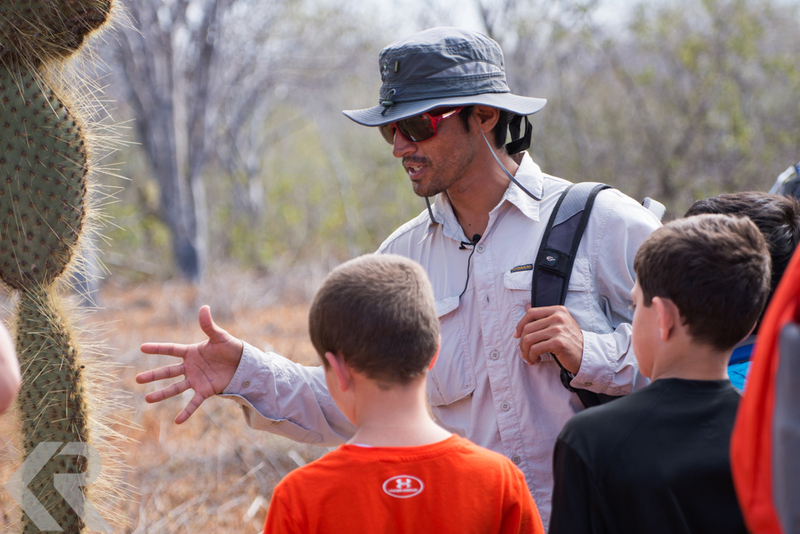 Naturalist Pato Maldonado explains to some young guests how different animals use the cacti growing on Santa Cruz Islands as food. Every hike, zodiac ride, or snorkel is led by a naturalist guide in groups of 16 or less. 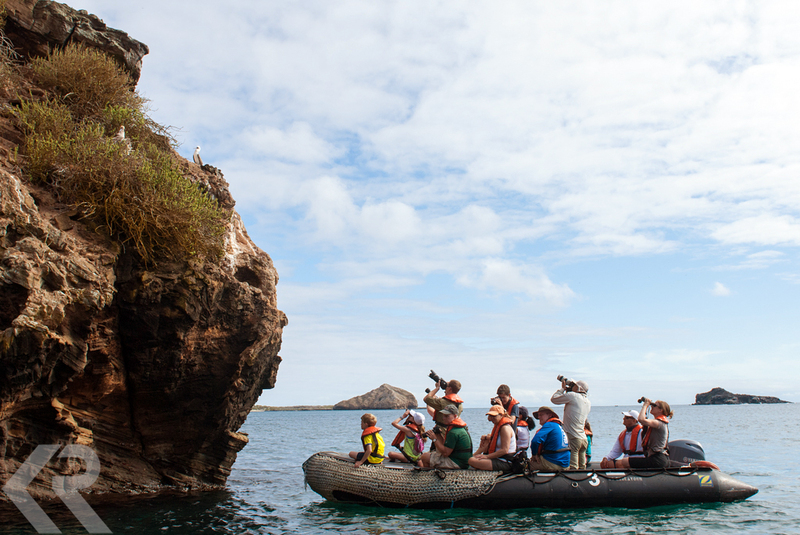 All naturalists in the Galapagos are required to be residents of the islands. 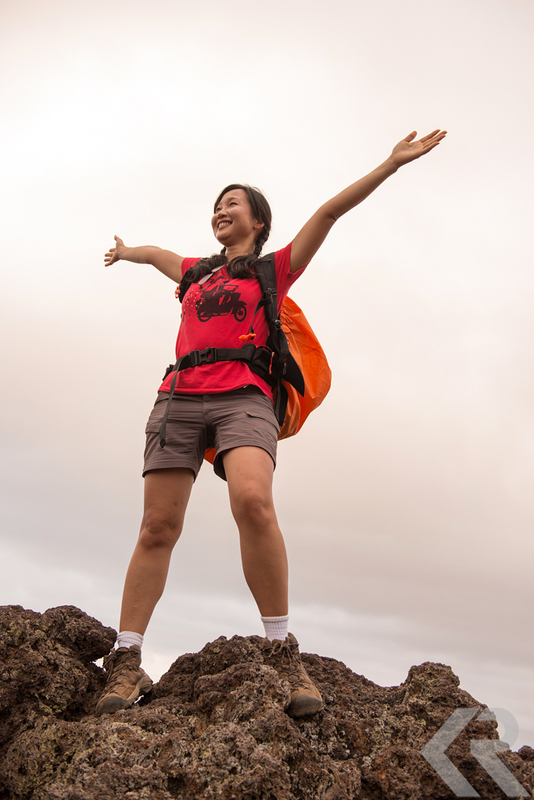 One of the guests expresses her joy at reaching the top of the hike near Darwin Lake on Isabela Island. This photograph of her happiness captures what it is like to explore these beautiful islands. One evening before heading to the recap session, guests had a cocktail at sunset while the ship cruised near Daphne Major Islet. The nightly recap sessions in the lounge included a briefing on the next day’s activities and could include mini-sessions on photography or natural history and perhaps a short screening of underwater footage from that day’s snorkel. You’ve got mail! 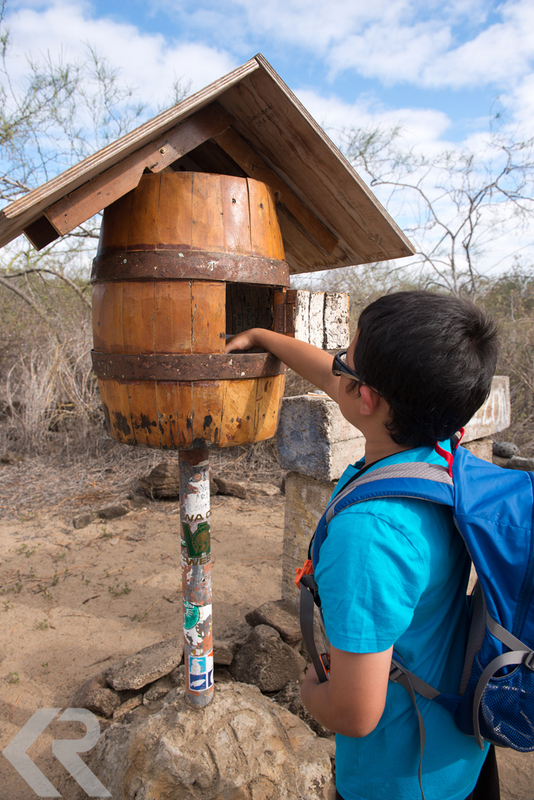 There are few signs of the history of man on the Galápagos Islands, but on Floreana Island there is a post office barrel where whalers and sailors would leave their correspondence to be picked-up and hand delivered by others who happened to be passing in the right direction. The tradition continues and I happened to pick up two postcards that I’ll be able to deliver in Oregon. Visiting the islands, you quickly learn how different each one can appear from the others. 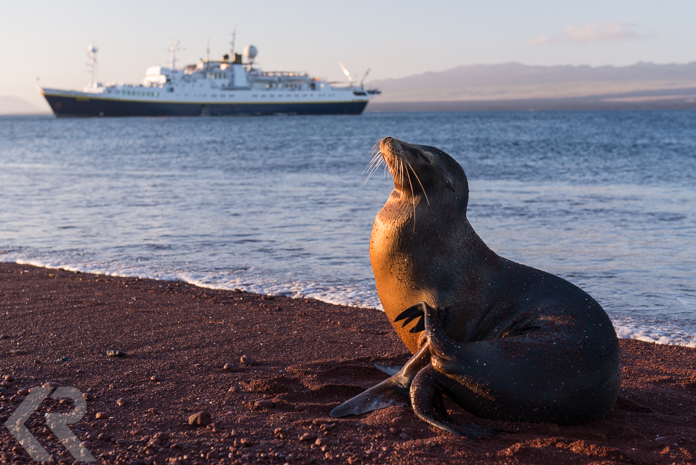 Fernandina is the youngest of the islands in the Galapagos. 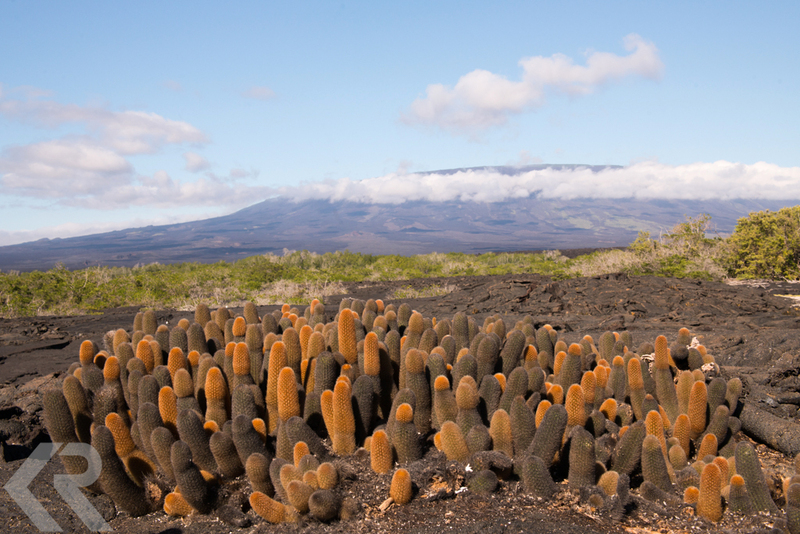 It is home to a large colony of marine iguanas and the endemic lava cactus species. 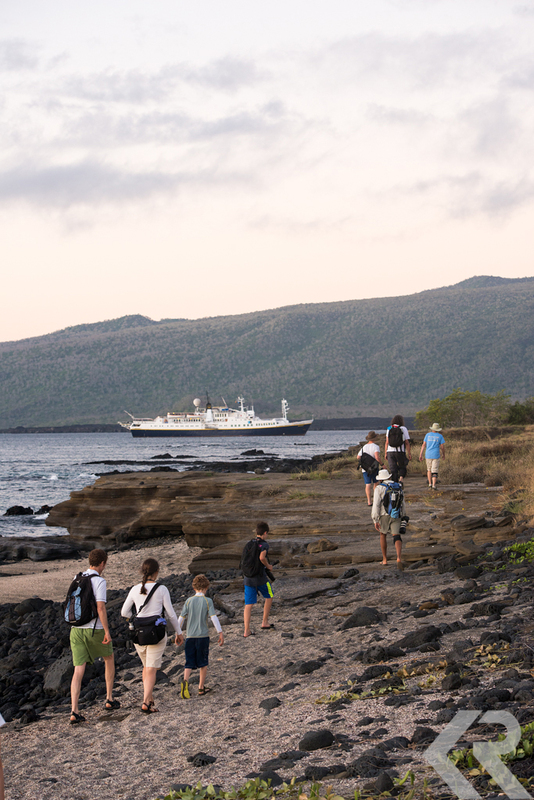 A hike comes to an end as guests walk back to catch a zodiac to the National Geographic Endeavour. On the two photo-focused weeks I taught on, we spent as much time as we could shooting the islands at sunset and sunrise. 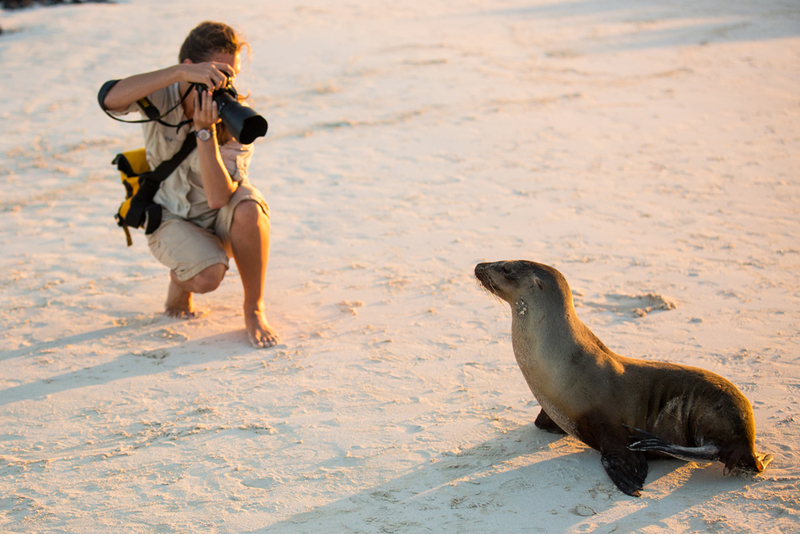 A photo of me photographing a sea lion in the Galápagos Islands. Perhaps I’ll see you in the Galápagos this fall? Photo by Naturalist Greg Aranea. Krista giving feedback during a one-on-one critique with a workshop participant in Washington, DC. Video still by Steve Pickard. Now that I’ve got your attention, no blue-footed booby picture here yet, but read on for a chance to learn how to photograph these unique birds with me in the Galápagos Islands. 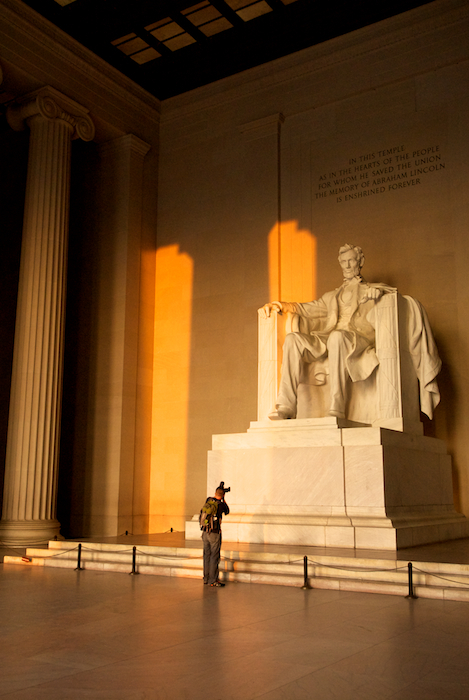 A student photographs the Lincoln Memorial during a sunrise shoot on a weekend photo workshop Krista taught with Dan Westergren. For the last few years I’ve been working as an instructor on National Geographic Expeditions’ weekend photo workshops in New Orleans and Washington, DC. I’ve not only been able to share my love for these two fabulous cities, but also share my knowledge of photography and photo editing. 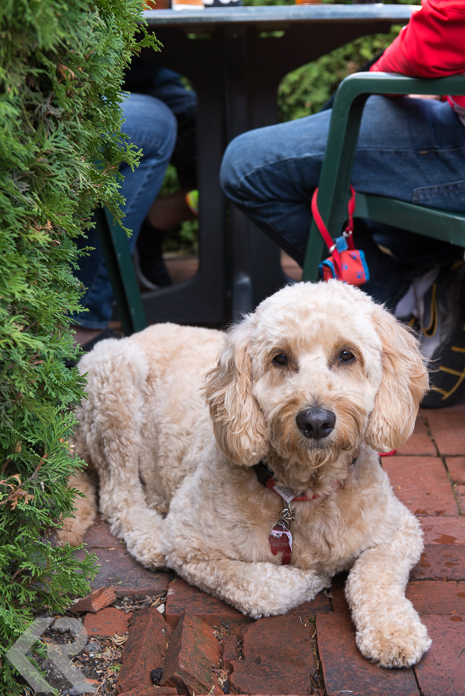 It is honestly a delight to be surrounded by people eager to learn and immerse themselves in photography for four days. Recently we had a videographer join one of the DC workshops led by Mark Thiessen to put together a taste of what the workshops are like. Check out the video put together by Steve Pickard. 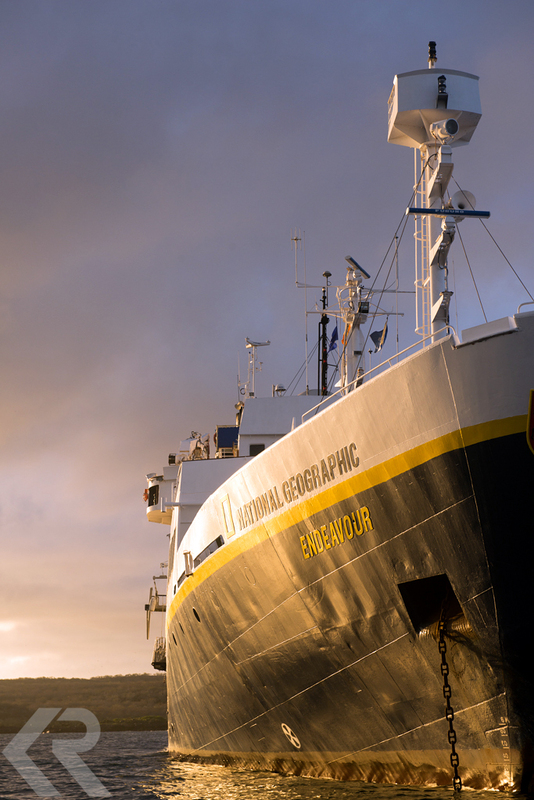 Also, I’m so delighted to share news that I’ll be working as a National Geographic Expert with National Geographic Expeditions on their Galápagos Photo Expeditions in 2014. From June 13th through 22nd we will be photographing the diverse wildlife and gorgeous scenery of the islands and spending time back on the National Geographic Endeavor ship delving deeper into learning photography. The next week I’ll be serving as a photo instructor with Expert Annie Griffiths and in October/November with Expert Rich Reid. Check out the full schedule here. I’m looking forward to exploring the Galápagos with students, new and old. I hope to photograph blue-footed boobies with you there!